Cities are, by definition, places where many people and activities locate close together, which maximizes accessibility, that is, it reduces the cost to people and businesses of reaching goods, services and activities. Space is always constrained in cities. 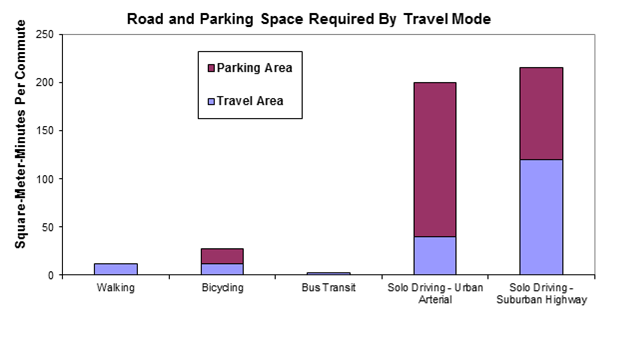 As a result, cities benefit economically and become more livable by favoring space-efficient modes (walking, cycling, ridesharing and public transit) over space intensive modes (low-occupant automobile travel). This was illustrated by a new study, Bikes Mean Business, just released by our local bicycle advocacy organization, the Greater Victoria Cycling Coalition. It summarizes the results of a survey concerning how business customers travel downtown. Using sidewalk interviews they found that 31% walked, 26% took public transit, 23% arrived by automobile, and 17% cycled to downtown that day. When asked about their expenditures, 74% of walkers, 68% of cyclists, 67% of bus riders and only 65% of motorists reported spending more than $100 downtown during a typical month. A survey of business managers indicates that they tend to underestimate the portion of their customers who walk, bicycle and use public transit. These results are consistent with other studies which find that, contrary to common perception, automobile customers are often a minority in urban commercial centers. There are good reasons to conclude that policies which support walking, cycling and public transit support local economic development. Economic impact studies indicate that money spent on vehicles and fuel generates fewer regional jobs and local business activity than expenditures on other goods, particularly restaurant meals, entertainment and professional services provided by downtowns and local commercial districts. As a result, transportation policies that allow households to save on vehicle fuel and purchases, and so leave residents with more money to spend on local goods, tend to increase local business activity and employment. This is an important and timely issue. Walking, cycling and public transit demand are growing, particularly in urban areas that are experiencing population growth, such as Victoria's core area which now has about 10,000 residents and is gaining hundreds more each year. Urban transportation planning often involves trade-offs between modes, such as reducing traffic speeds, and converting parking lanes to bus and bike lanes, or reducing parking supply. Such projects often face opposition based on the assumption that they are economically harmful. These studies can help justify walking, cycling and public transit improvements as part of a community's economic development strategy. This means, for example, that in many situations, virtually everybody can benefit from traffic calming, bike- and bus-lanes, and repurposing parking lots, because the reduction in automobile access is more than offset by improved walking, cycling and public transit, and more local residents. A few studies have quantified the amount of space required by various modes, but most only offer a snapshot: the road space required at one point in time. A study by professors Eric Bruun and Vukan Vuchic titled, The Time-Area Concept: Development, Meaning and Applications, developed a way to measure the total space required by each mode, measured in square-meter-minutes (square meters of road and parking space times the number of minutes occupied), as illustrated by the following graph. Because of their size and speed (faster vehicles require more road space), automobiles require far more total space than other modes. This is not to say that urban commercial centers should forbid cars, but it does suggest that when making trade-offs between different forms of access, cities will benefit overall by favoring walking, cycling and public transit. Congratulations, Greater Victoria Cycling Coalition, for shedding light on an important issue. Eric Bruun and Vukan Vuchic (1995), “The Time-Area Concept: Development, Meaning and Applications,” Transportation Research Record 1499, Transportation Research Board, pp. 95-104. Gary Hack (2013), Business Performance in Walkable Shopping Areas, Active Living Research. T. Fleming, S. Turner and L. Tarjomi (2013), Reallocation of Road Space, Research Report 530, NZ Transport Agency. GVCC (2014), Bikes Mean Business, Greater Victoria Cycling Coalition. Todd Litman (2012), Evaluating Active Transport Benefits and Costs: Guide to Valuing Walking and Cycling Improvements and Encouragement Programs, Victoria Transport Policy Institute. Todd Litman (2012), Toward More Comprehensive and Multi-modal Transport Evaluation, Victoria Transport Policy Institute. Kyle Rowe (2013), Bikenomics: Measuring the Economic Impact of Bicycle Facilities on Neighborhood Business Districts, University of Washington. SDOT (2011), Neighborhood Business District Access Intercept Survey, Seattle Department of Transportation. Fred Sztabinski (2009), Bike Lanes, On-Street Parking and Business A Study of Bloor Street in Toronto’s Annex Neighbourhood, The Clean Air Partnership . Rodney Tolley (2011), Good For Busine$$ - The Benefits Of Making Streets More Walking And Cycling Friendly, Heart Foundation South Australia.